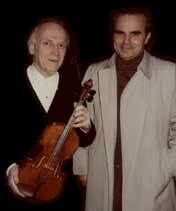 Lord Yehudi Menuhin in 1985 with his Nagyvary violin. Dr. Joseph Nagyvary has brought an unprecedented level of academic expertise to bear upon the age-old violin puzzle. A native of Hungary, he majored in chemistry at the Eotvos Lorand University of Budapest (1952-1956); he became a student of the Swiss Nobel Laureate Paul Karrer in 1957, and received his PhD in the chemistry of natural products in 1962. While in Zurich, he had his first formal violin lessons on a violin which once belonged to Albert Einstein, a coincidence which helped turning his attention to the physical mysteries of the violin. He gained his first glimpses into the art of violin making from the Zurich luthier Amos Segesser. In 1963, he spent a postdoctoral year in Cambridge with Lord Alexander Todd, a British Nobel Laureate. He came to the United States in 1964, and settled down in Texas in 1968 where he has remained a professor of biochemistry and biophysics at Texas A&M University until his retirement in 2003. Dr. Nagyvary was the recipient of a Career Development Grant,and numerous other research grants from the National Institutes of Health, the National Science Foundation, and the NASA. His discoveries concerning the classical violins were made public in over 255 lectures sponsored mainly by the American Chemical Society. On such occasions, his claims were examined by professionals and comparisons were made between Professor Nagyvary's new recreations and the finest locally available antique Italian violins, including several Stradivaris. The 25th anniversary of Professor Nagyvary’s Stradivarius research at Texas A&M University was celebrated by a special event on Feb.12, 2001 in the George Bush Presidential Library and Conference Center. Featured speaker was Dr. A. E. Pavlath, the president of the American Chemical Society. Zina Schiff presented a recital playing first her Stradivarius, then her Nagyvarius violin. This led to the making of The Stradivarius Puzzle CD. Another high-profile public comparison was organized by the national science association Sigma Xi in 2002, in which Shunsuke Sato played both a great Strad (the Booth) and a new Nagyvary-Chen violin. A concert and a blind test were presented to an audience of 600 at the George Bush Presidential Library in 2003 under the sponsorship of the German MiraMedia as a part of their documentary "Stradivari: A Search For Perfection". On Dec. 15, 2005, Dr. Nagyvary was the featured speaker at the Einstein Centennial Celebration of the World Year of Physics, in Tokyo. The event included an evaluation of a Nagyvary violin by a panel of physicists and a concert on the same violin by Mariko Senju. On this occasion, Dr. Nagyvary was awarded a gold medal of the Japanese Physics Society for his discoveries of microcomposites and nanocomposites in the old Italian finishes. Dr. A. E. Pavlath, president, American Chemical Society: " The ACS is pleased to have been the sounding board of Dr. Nagyvary’s accounts of his research on the violin for the past 25 years. He has been the pioneer of the chemical paradigm in violin making. Many of us have been persuaded by him that the Holy Grail of violin making is to be found in the chemistry of the materials. Indeed, this may be one of the truly inspirational applications of chemistry". Isaac Stern, violin virtuoso: "Dr. Nagyvary’s knowledge of the tone quality of great violins as well as their method of construction makes his work of special value to us all today. I would think that any artist or technician could but learn from his years of study. There are few people today who could write authoritatively on the subject. He is one of those few. With him go my warmest personal greetings and every good wish for continued success in his work." The history and interpretation of chemical knowledge available to violin makers. J. Violin Soc. of America, Vol. IV, Nos. 3&4, pp. 147-176, 1978. The effects of minerals and fiber on plate tuning. Ibid. Vol. VI, No. 2, 54-79, 1981. Strategies for acoustical varnish. Ibid. Vol.VI, No. 3, 19-25, 1983. The Cremona gold color: Its chemistry and reconstitution. Ibid.,VII., No.2, 88110, 1984. The chemistry of Stradivarius. Chem&Eng News, May 23, 1988. J. Nagyvary and J. Ehrman. The composite nature of the antique Italian varnish. Die Naturwissenschaften, 75, 918-920, 1988. Entzifferung des Stradivari-Tones und allgemeine Geigenforschung in Texas. Das Musikinstrument, 42, No.6-7, pp.107-111, 1993. Modern Science and the Classical Violin-- a View from Academia. The Chemical Intelligencer, 2, No. 1, 24-31, 1996. Investigating the secrets of the Stradivarius. Education in Chemistry, July 2005, pp.96-98. J.Nagyvary, J.A. DiVerdi, N.L. Owen&H.D. Tolley: Wood used by Stradivari and Guarneri. Nature, 444, 30 Nov. 2006, p.565. "What is music?" PBS Nova special program featuring violin research at TAMU. Also, ABC World News, NBC Nightly News. Major articles in New York Times, Times of London, Die Welt and diverse magazines such as The Smithsonian, Science '84, Readers Digest, Discovery, People,and Southern Living. Nothing could be more flattering though than the inclusion of Nagyvary's work in the 6th grade Science textbook published by Silver Burdett&Ginn, and in the high school textbook "Modern Chemistry" by Holt, Rinehart and Winston. Recordings on CD using Nagyvary violins were made by Zina Schiff on Stradivari Classics label (Bach&Vivaldi, SCD 8010; The Lark Ascending, SCD 8011), and by Suzan Leon under Classiopee Disques (Dvorak, DDD 969252; Faure DDD 969251). On a part-time basis include Mrs. Mary Ann Nagyvary (BS in chemistry, MS in food science), daughters Monique and Katie, who are involved in several technical and business aspects. Apprenticed with his father, Chen Chao Xuan in Beijing. Married, 2 daughters. 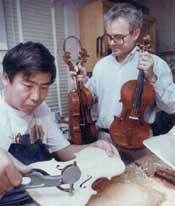 In 1987, Mr. Chen was awarded the Gold Medal in workmanship for viola in the All-China Musical Instrument Competition. In April 1989, Mr. Chen came to Texas A&M University on the invitation of Professor Joseph Nagyvary to serve as the resident violin maker on a State project. During his 3-years of employment, Mr. Chen distinguished himself by copying many famous models and crafting several modifications. Since April 1992, Mr. Chen has his own business named "Richsound Violins", while maintaining part-time collaboration with Dr. Nagyvary. In 1999, a violin of Mr. Chen was awarded a certificate of merit for tone at the competition of the Violin Society of America. Mr. Chen is also selling the instruments made by his brother, Guang-Xi Chen, and other family associates in Beijing.